Dr. Havilah Beardsley is the "Father of Elkhart." Born in 1795 in Connecticut, of Welsh descent, he was the fifth son of Elijah and Sally (Hubble) Beardsley. The family moved to Ohio while Havilah was still a boy. At age 17, he served in the War of 1812, and at age 21, began his medical studies. After graduation, he practiced medicine in Ohio. In 1823, he married Rachel E. Calhoun in Greenfield, Ohio. Rachel was a first cousin to statesman John C. Calhoun. By all accounts, their marriage was a very happy one, and Rachel was very supportive of all of Havilah's ventures. On a return trip from Chicago to Ohio, Havilah made a stop in the Elkhart area, because he had heard about the beauty of the St. Joseph Valley. He was impressed with the natural water power available and decided to take advantage of it. By 1830, he and Rachel had settled on the north bank of the St. Joseph River. Almost immediately, he built the first mill on Christiana Creek, making use of the natural fall of the stream for power. Then, in 1831, he purchased a large tract of land from Potawatomi Chief Pierre Moran for $1500.00. This land included much of what is downtown Elkhart today. In 1848, Havilah and his wife built the first brick house in Elkhart, now known as the Havilah Beardsley House. The Beardsleys and their children would have an immense impact on the community and in some cases, well beyond. 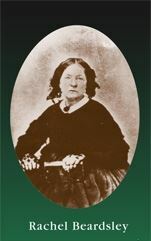 Havilah Beardsley died in Elkhart, May 23 1856. His wife, Rachel, passed away in 1890. Edwin Beardsley (1824-1913) was the eldest and longest-lived child of Havilah and Rachel Beardsley. Known as an innovator and patent-holder who lived most of his adult life in Chicago, Edwin is best known to historians for his 1906 article on Chief Pierre Moran and the founding of Elkhart. Charles Beardsley (1827-1878) attended Indiana University in Bloomington and studied Medicine in Cincinnati, but never practiced. He worked all of his life in Elkhart as an engineer and public servant. Charles was instrumental in developing Grace Lawn Cemetery, which is named after his adopted daughter. Charles served as an Elkhart City Trustee and Civil Engineer, and also served two terms in the Indiana State Senate. James Rufus Beardsley (1829-1902) worked with his father Havilah in several of his manufacturing enterprises. He was president, and later a director of the First National Bank of Elkhart, owned a paper mill and was a partner in a flour mill and a starch factory. He was secretary of the Elkhart Hydraulic Company which had built a dam on the Elkhart River. Along with other investors, he helped bring the first streetcars to Elkhart in the 1880s. Active in politics, James served two years in the Indiana State Senate, and was elected Elkhart's second mayor in 1876. Sarah Francis (Beardsley) Davenport (1831-1890) married B.L. Davenport, a prominent Elkhart banker. He became president of the First National Bank of Elkhart, and served two terms in the Indiana State Senate. Raper Beardsley (1833-1833) Died in infancy. Narcissa Beardsley (1835-1835) Died in infancy. Richard Beardsley (1838-1876) laid out the first Beardsley Addition (similar to a subdivision) in Elkhart, the first of many Beardsley real estate projects. He also served in the US Federal Army during the Civil War and participated in the captures of New Orleans and Vicksburg. President Lincoln appointed him US Consul to Jerusalem, and he was promoted to Consul General for the US to Cairo. 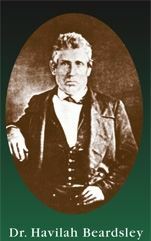 Richard Beardsley died and was buried in Egypt in 1876.